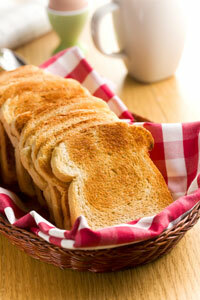 Bread toasts to perfection every time thanks in part to the toaster’s auto-adjusting bread guides. Sleek curves and savvy simplicity make this Oster two-slice toaster one to behold. The toaster takes up minimal counter space even as adding a variety of versatility and reliability to that on a regular basis routine. 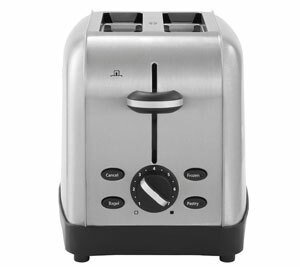 To operate, simply drop the item or items to be toasted into one or both slots, turn the dial to choose the shade setting from light to dark, and start the toasting process by pressing down on the lever, which lowers the bread into the heating chamber. The shade-setting dial ranges from one (lightest) to seven (darkest). 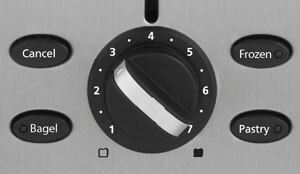 In addition to the shade-setting dial, the toaster offers simple push-button controls. Choose between three food-make a selection buttons, each with a handy indicator light: Bagel (for toasting one side and warming the other), Frozen (perfect for weekday waffles), or Pastry (who doesn’t love a warmed sweet treat?). There’s also a Cancel button for ending the cycle at any time. If no food-make a selection buttons are chosen, the toaster will default to the toast setting. Other highlights include a toast lift that elevates smaller pieces of hot food out of the bread slots for secure, easy retrieval; a removable crumb tray for quick, convenient cleaning; and a brushed stainless-steel finish with a brushed knob and lever accent for timeless good looks. 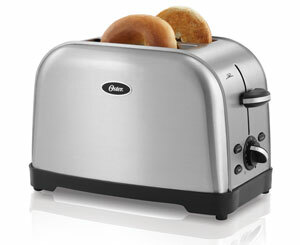 The Oster two-slice toaster makes a lovely housewarming or wedding gift idea and an attractive and useful addition to any ensemble of countertop appliances. Breakfast time just got easier (and better). Could someone please pass the jam?